A granular fly bait that attracts and kills nuisance flies in or around livestock production facilities, poultry houses, and horse stables. 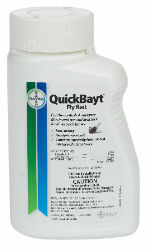 QuickBayt® contains a specially formulated mix of attractants and the proven active ingredient imidacloprid, to attract and start killing nuisance flies in as little as 60 seconds. Can be used as scatter bait or mixed with water and used as a paint-on to surfaces where flies rest. The bait should be scattered onto dry level surfaces (e.g. pathways, window ledges, shallow dishes). Scatter it evenly over the surface without too much accumulation. The product can also be used in bait stations to be placed, where flies will most likely take a rest. Avoid extremely dusty areas. Paint-on application: To prepare a paste for painting take 100 g of granules, solve it well in 80 ml water. 15 minutes after mixing the paste can be applied with a brush to spots where flies rest (e.g. walls, joists, window ledges, stable fixtures). Additionally it can be painted onto hessian bags, sheets of cardboard or fabric which are hung in areas frequented by flies.